Photo: James Grant Watts House, ca. 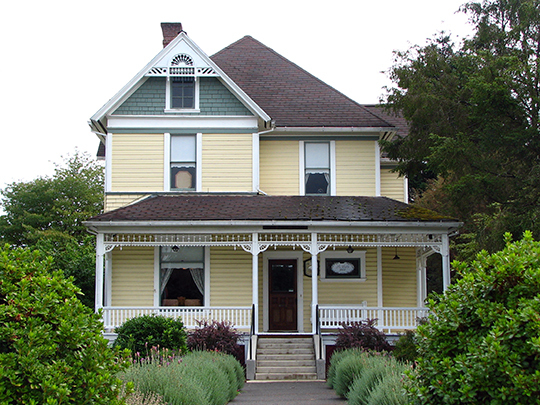 1902, 206 SE 1st Street, Scappoose, OR. Listed on the National Register of Historic Places in 1982. Photographed by User:Werewombat (own work), 2009, [cc-by-3.0 (creativecommons.org/licenses/by/3.0)], via Wikimedia Commons, accessed September, 2013. The Columbia County Courthouse is located at 230 Strand Street, St. Helens, OR 97051; phone: 503-397-7210. Lewis and Clark passed through the area in 1805 on their way to the Pacific Ocean. During the next three decades many sailing ships entered the Columbia River to trade with Northwest Indians. A lumber mill was established in the St. Helens area in 1844 and the first townsite was started in 1847 and grew rapidly with a heavy influx of settlers in the early fifties. As a port for the Pacific Mail Lines, St. Helens flourished—rivaling nearby Portland. Columbia County was created on January 16, 1854, from a section of Washington County. St. Helens became the County Seat permanently after an election in 1903. Columbia County, located in northwestern Oregon, has a total land area of 676 square miles, of which about 30 square miles are water-covered. County of Columbia, OR, Columbia County Comprehensive Plan: History, 1984, 222.co.columbia.or.us, accessed September, 2013.